Our new home is located at 6257 Cropper Road between Shelbyville and Cropper, KY. This easiest way to get here from Louisville or Lexington is to take I-64 to the Rt. 53 exit, then follow Mt. Eden and Cropper Roads. Currently Google Maps thinks we are in the 5590 block (or something else – seems to depend on the day – go figure). 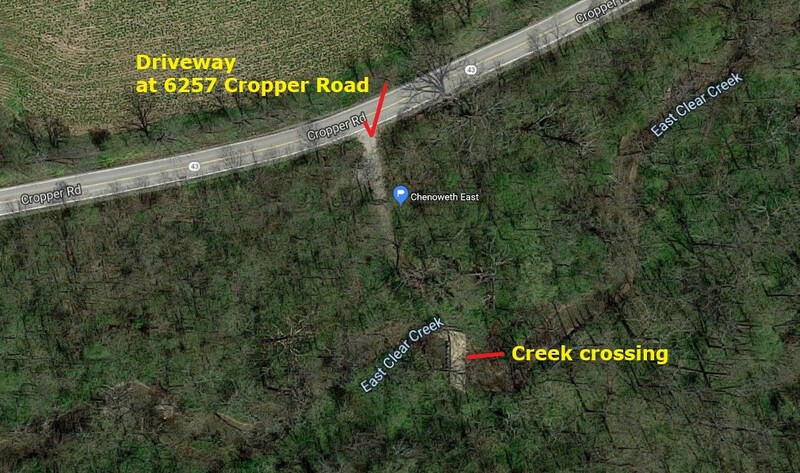 We are on the right as you go to Cropper– just look for the crossing back in the woods (see aerial shot below). At some point soon there will be signs that say “UBuildIT” and also “Chenoweth East”, which is the name of our new home. For simple directions from wherever you are, click here. For an idea of what the driveway and gates look like, see this post.